The diaceturate diminazene active ingredient inomazène has curative activity against trypanosomes and Babesia. The antipyrine ensures perfect dissolution of the active principle and helps fight against inflammation. 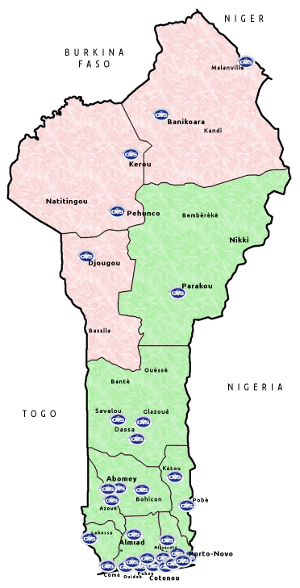 Indications: cattle, sheep and goats, including treatment of blood protozoan trypanosomes and piroplasmosis. Packaging: box of 10 bags of 2 g containing 875 mg of diminazene diaceturate and box of 10 bags containing 23.6 g 10.5 g aceturate diaceturate. Deep intramuscular injection. 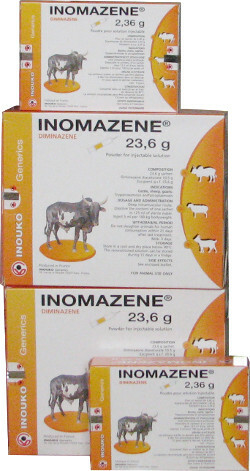 The recommended dose is 3.5 mg of diminazene diaceturate kg body weight for all animals. In infections caused by resistant parasites, it is recommended to increase the dose up to 8 mg / kg. Dissolve the contents of one sachet of 2 g inomazène in 10.5 ml or 150 ml of sterile water, or that of a bag of 23.6 g in 125 ml of sterile water to give 12.5 respectively ml or 150 ml of injectable solution at 7%. Do not exceed a total dose of 4 g diaceturate aceturate per animal. If relatively large injection volume, it is recommended to divide into two separate injections sites.